Welcome to Portiera Designs ...Artware for the Home! 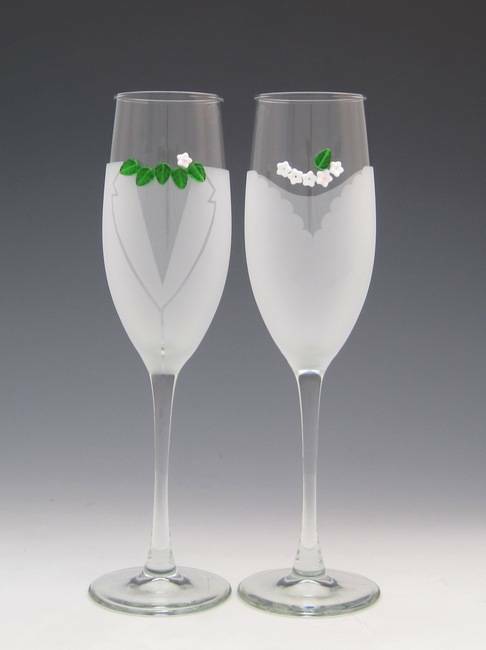 These Bride & Groom Champagne toasting flutes from Asta Glass are the greatest for your resort destination wedding. She wears a traditional Hawaiian wedding lei of white glass flowers, he the groom's ti lei of green glass leaves. A lovely way to toast the perfect Hawaiian wedding, honeymoon, or anniversary trip. They are distinctive and special, but also have a classic look that's tasteful with any summer or natural wedding motif. Make a real statement at your festivities with these special his and her champagne glasses. Sweet and romantic, these handcrafted champagne glasses are a lovely way to toast the perfect day or ring in the New Year. These toasting flutes are the perfect wedding gift for yourself or that special couple. They also make a great Valentine's Day gift for your special someone.